Former winner Mark Cavendish may have suggested he’ll never ride Milan Sanremo again due to the planned course changes in the finale of the race but the Briton could yet appear in this year’s edition of the Classic after the inclusion of the new La Pompeiana climb has been called into question. In September the climb was confirmed as being added to the 2014 route and likely for subsequent years. Organisers had wanted to toughen things up in the finale of the Classic, and made two key changes. Out went the climb of Le Manie, which this year summited 204 kilometres after the start and 94 from the end. 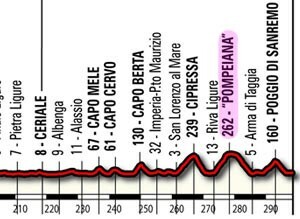 In came the Pompeiana, which is five kilometres in length and was scheduled to feature between the Cipressa and the Poggio. However that plan has run into difficulty. According to La Stampa, the climb is almost certainly out of the race due to safety concerns. The local administration has pointed out a number of dangers, including the absence of guard rails on long stretches of the road, the technical and narrow downhill and landslides which occurred recently after heavy rain. La Stampa states that carrying out modifications to the climb and descent in order to render it less dangerous would cost tens of thousands of euros, something which is deemed too expensive for the provincial administration. RCS Sport is yet to respond to the news, or indeed to confirm it. However there is now a big question mark over the finale of the race and, as a result, the possibility that riders such as Cavendish may reverse their earlier decisions not to ride.